Young Fans Can Go “Around the World with Peppa” This Sunday, March 26! You are here: Home / Media Reviews / Young Fans Can Go “Around the World with Peppa” This Sunday, March 26! A brand-new Peppa Pig special episode, “Around the World with Peppa,” is premiering on the Nick Jr. channel this Sunday, March 26, at 7pm ET/PT! In “Around the World with Peppa,” Peppa and her family set off for the park to celebrate the start of the summer holiday. But when their car breaks down, Miss Rabbit lends them her plane for the day and they get swept away on a high-flying adventure all around the world! 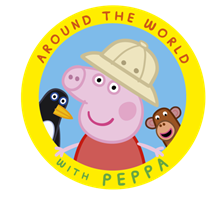 And to help get you ready to go “Around the World with Peppa,” check out these adorable activity sheets based on the new episode You can also download them at: http://www.peppapig.com/grown-ups/around-the-world.